Beneath the keycaps, we found Kailh’s new low-profile switches. 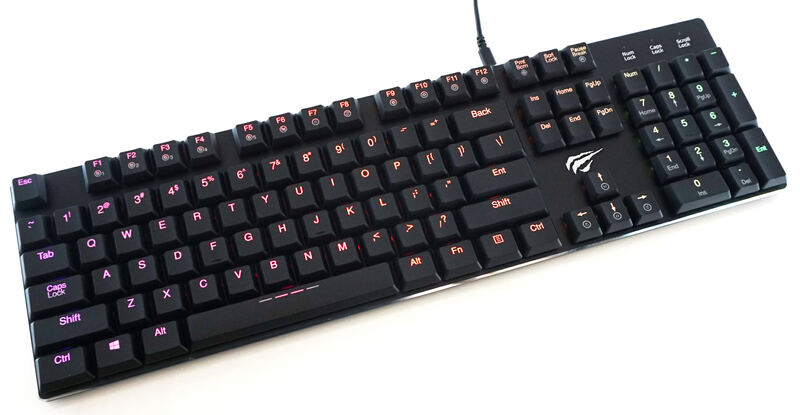 Although they appear to be a copy of Cherry’s ML low-profile switch, neither their dimensions or their keycaps match. This is not Kailh’s first attempt with low-profile switches, as they have been trying for at least a couple of years. The new switch is tactile, clicky, with a very low operating force, and has a travel distance of just 3 mm. Combined with the proprietary keycap design that reduces the keycap height by another 7 mm, the new configuration is much shorter than a standard stem & keycap configuration. 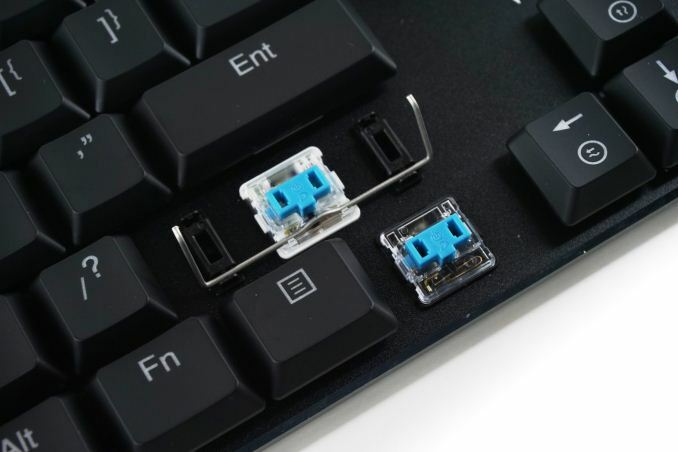 The downside here is that both the proprietary switch stem and the low-profile keycaps make finding aftermarket replacements practically impossible. The switches are attached to the aluminum frame of the keyboard and have clear bodies to better diffuse the light coming from the RGB LED mounted underneath their top center. Costar-type stabilizers can be found underneath the larger keys. The HAVIT KB395L features RGB backlighting that by default is controllable via the available keystroke combinations. The primary issue here is not the number of pre-programmed effects, but that there is no option to tune the brightness without having to rely on the software. Although the backlighting is not particularly bright, we suspect that users working in rooms where the ambient lighting changes quickly would like the ability to adjust the brightness equally quickly. Generally speaking, the backlighting is well applied. Despite the clear body of the switches, there is minimal light bleed towards any side of the keycaps. Secondary characters printed on the lower half of the keycap, like on the Function keys, are barely visible. HAVIT moved the secondary characters of nearly all of the main keys to the top of the keycap, but all of the backlight control indicators and most of the secondary functions of the numpad are practically left unlit. This is not uncommon on a backlit mechanical keyboard, but the design of the Space Bar really left us pondering what the designer was thinking. The Space Bar has an extended backlighting opening, one that is usually combined with multiple LEDs mounted beneath the keycap. The KB395L only has one and the keycap’s outermost translucent openings are entirely dark, which is a significant visual dissonance. Someone looking at the keyboard for the first time will probably think that there were LEDs there that are turned off or dead. It would be much better if the Space Bar had a single short line at its center, like any other key. Opening up the body of the KB395L reveals only the main PCB of the keyboard. The switches are attached to the aluminum frame and the PCB is soldered directly on their underside. No wires or any additional/removable parts can be seen. Due to the thinness of the plastic lower cover and the fragility of the plastic switch stems, it will definitely will not survive severe abuse, but it is strong enough for typical everyday use. 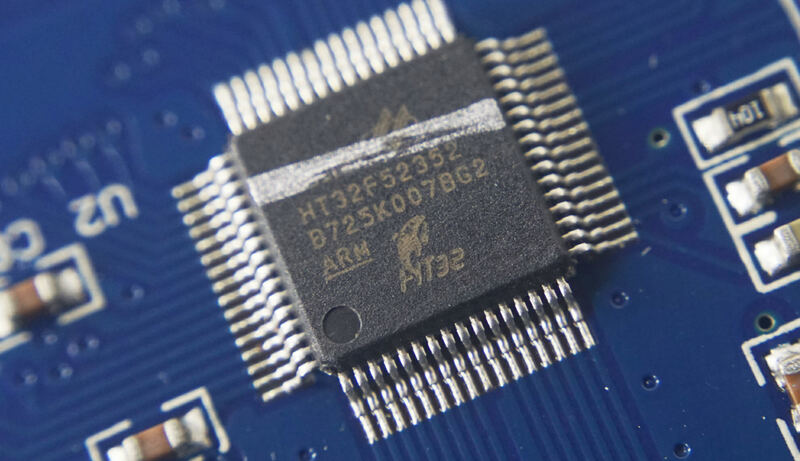 The heart of the KB395L is a Holtek HT32F52352 microcontroller. It has a 48 MHz ARM processor and 128 KB of onboard flash. It is a chip that we normally expect to see in more advanced implementations and quite a bit of an overkill for the capabilities of the KB395L. Meh. I've seen a lot worse. RGB lighting can be turned off, and it's a helpful visual aide for us hunt-and-peckers. Although I agree with you that the keycap font/design is terrible. Who thought the "____" on the space bar was a good idea? Or that the font on the Shift/Ent/Back keys should be larger? Or that they should read "Ent" and "Back" instead of "Enter" and "Backspace"? It's actually surprising to me that more people aren't pickier about their input devices. If you work in a profession where you're going to sit there and type all day, I would think the keyboard you use, etc., is pretty important. I have several split mechanical keyboards, and those tend to start at around $200. The Kinesis Freestyle Edge, which is what I'm currently using, has key backlighting. At first, I thought it would just be a gimmick, and turned it off. I also turned it off because, before the latest firmware update, the backlighting was ridiculously bright and distracting even on the lowest setting.